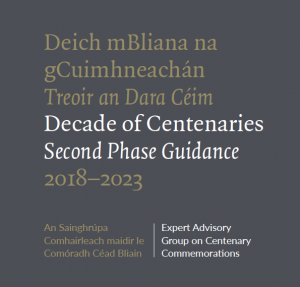 Publication of ‘Decade of Centenaries: Second Phase Guidance, 2018—2023’ by Expert Advisory Group. At the first cabinet meeting of 2019 the government noted the success of the Decade of Centenaries programme to date, particularly the centenaries of the Easter Rising, First World War, and the introduction of voting rights for women and their right to stand in parliamentary elections. The government also noted the proposed overall approach to commemorations over the remainder of the Decade of Centenaries, developed by Minister Madigan with regard to the principles laid down in the Second Statement of the Expert Advisory Group on Centenary Commemorations published in October 2017 and also the most recent specific guidance from the group, which it developed in 2018 following a public consultation process. The objective of the state commemorative programme for the years from 2019—2023 is to ensure that this complex period in our history, including the struggle for independence, the civil war, the foundation of the state and partition, is remembered appropriately, proportionately, respectfully and with sensitivity. It aims to promote a deeper understanding of the significant events that took place during this period and recognises that the shared historical experience of those years gave rise to very different narratives and memories. It will also take account of sensitivities across communities in Northern Ireland and continue to recognise that very different perspectives persist on many of these events. Minister Madigan remarked that ‘I am committed to ensuring that the State’s approach to remembering all of those who lost their lives during the Independence Struggle, and the significant events and themes associated with this period, will be based on the respectful, sensitive, proportionate and authentic approach that has become the hallmark of the Decade of Centenaries commemorative programme. In planning the various commemoration events the Government will continue to be advised and supported by the guidance of the Expert Advisory Group on centenary commemorations, chaired by Dr Maurice Manning and by the all-party consultation group on commemorations which I have recently reconvened. I want to thank the Expert Advisory Group for its guidance report which I have published today’. The full report is available to read or download here.